Canada took the slasher movie to the next level when the country produced the trendsetting BLACK CHRISTMAS in 1974, at the height of what has become known as 'Canuxploitation'. Later shockers from the nation of moose, Mounties and maple syrup included the equally effective MY BLOODY VALENTINE (1981) and HAPPY BIRTHDAY TO ME (1981) but by the turn of the eighties the terror-trend was drying up... at least until the plasma-spilling shocks of POPCORN in 1991! This is Canadian slice and dice action par excellence - and returns to the good old days of splashed blood, high body counts and a mysterious killer as a young female screenwriter (played by the great Scream Queen Jill Schoelen from THE STEPFATHER and CUTTING CLASS) suffers nightmares of a strange figure who may well be breaking into the 'reel' world. 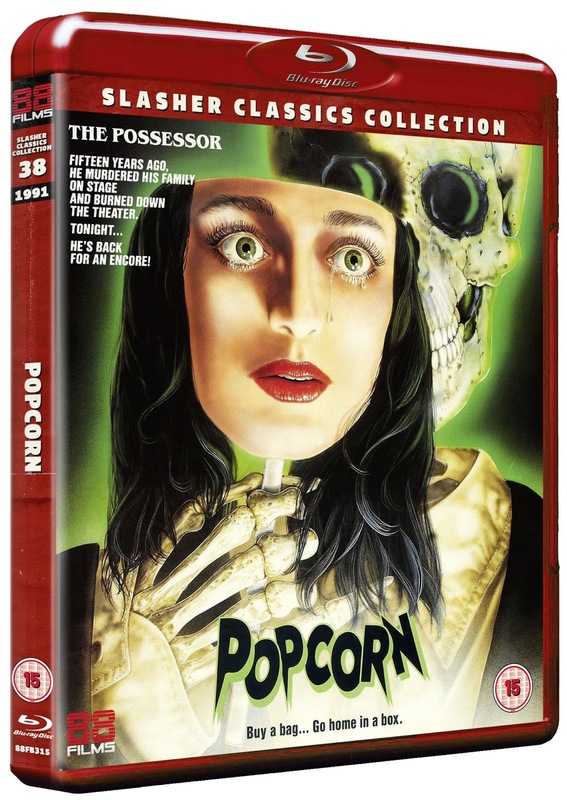 Postmodern and provocative, and featuring a genre ensemble cast that includes Dee Wallace Stone (THE HOWLING) and Kelly Jo Minter (THE PEOPLE UNDER THE STAIRS), POPCORN has maintained a following of macabre movie fans for decades since its release! Alternatively you can pre-order at Amazon but do be aware that this is the NON-slipcase version.